This has been an interesting couple of weeks. On 5 November, Bonfire Night, the Monetary Policy Committee (MPC) at the Bank of England announced that it would ­extend its programme of quantitative easing by £25bn. More important, for the Blanchflower family, that day was also my parents' 60th wedding anniversary. We had a great party and, to top it all, they received a card from the Queen. As a kid I thought everyone had fireworks on their parents' anniversary. Penny for the Guy? And then, on 11 November, the MPC published its inflation report, which nobody seemed to believe, including Mervyn King. That was absolutely clear from the press conference he gave on the morning the report was released. His message was all doom and gloom. He seemed uncomfortable. Indeed, his body language and sombre mood suggested that he thought, as I do, that we are still in for very tough times ahead. Mervyn's message confused the markets because the report he was there to discuss said something totally different. Its central projection suggested that growth in 2010 and beyond would be as high as 4 per cent, and maybe even higher, which is way above the market consensus of about 1.9 per cent, and very different from the sluggish growth Mervyn was portraying. This unbelievable forecast of rapid growth doesn't sit well against a background in which - and I quote from the inflation report - "businesses continue to make sharp cutbacks to spending in the face of weak demand, uncertain growth prospects and tight credit conditions. Capital spending was estimated to have fallen by more than 10 per cent in 2009 Q2, and de-stocking continued. Business investment is likely to fall further in coming quarters, although a reduction in the pace of de-stocking should boost output." Of particular importance in the report was a new chart that the MPC had never presented before. Precedent is everything among central bankers, so there would have been much discussion in the bank about its inclusion. It shows how rapidly the MPC forecasts the economy will return to the level of GDP that existed at the beginning of the recession, in the second quarter of 2008. The answer from the chart is that the level of output in billions is projected to return to pre-recession levels within three years. Six quarters down and six quarters up. Far from slow and sluggish, this is growth at an implausibly rapid pace. The MPC has once again entered the world of wishful thinking, as it did at the beginning of the recession that it failed to spot. Wrong on the way down, wrong on the way up. I have used the data from the MPC's forecast to redraw a chart I used in an earlier column. 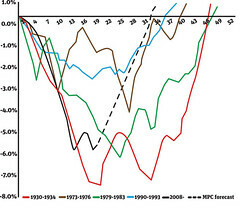 The chart (above) shows that the drop in the level of output is greater, so far, in this recession than was observed in the 1970s or 1990s recessions, but broadly comparable to that observed in the 1980s. It is not as deep as in the 1930s. But what stands out from this chart is how long it takes to emerge from a deep recession. In both the 1980s and the 1930s, it took just over four years for output to return to its pre-recession levels. And upswings can be false dawns, with W-shaped, rather than V-shaped, recoveries, as in the 1930s and 1970s. But not this time around, according to the MPC - it will take only three years to emerge from the greatest financial crisis in a century. I have drawn in the MPC's forecast, as best I can, as a dashed line on the chart. The six quarters of negative growth, which lowered GDP by around 6 per cent, will, according to the committee, be followed by approximately six quarters of positive growth to get back to pre-recession levels of output. The MPC is fore­casting the fastest recovery seen in the UK since the Second World War. Doesn't look very believable, does it? My suspicion is that the MPC was not unanimous and Mervyn was, once again, in the minority, perhaps with David Miles and maybe one or two others. Mervyn was likely giving his own view (and mine) at the press conference. In the long run, it is not sustainable for the ­governor to hold a minority position: something has to give. I am afraid this absolutely unbelievable forecast has lowered the already battered reputation of the MPC still further. So how exactly is quantitative easing going to translate so quickly into this rapid-growth phase? Conveniently, the committee omits to tell us. These are still very early days and this crisis is not over by any means. My concern all along has been that stimulus would be insufficient to prevent a huge rise in unemployment, primarily because banks are not lending and credit is hard to get. The recent slowing in the growth of unemployment is encouraging, but incomes are down a lot, which is going to have an impact on spending down the road. My main point through all of this has been that we need to err on the side of putting too much stimulus into the economy to help ­prevent something terrible happening. And it still might. The economy could turn down again in a heartbeat, especially if recovery in the rest of the world is anaemic or policy is tightened too early. The MPC, however, assumes that the chances of a W-shaped recovery are slim to none. Honestly, it seems to me that the committee's members have lost the plot. Is it time to consider getting rid of this MPC for the good of the country, and letting Mervyn (or perhaps Mervyn and the Chancellor, Alistair Darling) set monetary policy? Oops, I nearly forgot to say happy anniversary, Mum and Dad. David Blanchflower is professor of economics at Dartmouth College, New Hampshire, and at the University of Stirling.